We study the problem of detecting data exfiltration in computer networks. We focus on the performance of optimal defense strategies with respect to an attacker’s knowledge about typical network behavior and his ability to influence the standard traffic. Internal attackers know the typical upload behavior of the compromised host and may be able to discontinue standard uploads in favor of the exfiltration. External attackers do not immediately know the behavior of the compromised host, but they can learn it from observations. We model the problem as a sequential game of imperfect information, where the network administrator selects the thresholds for the detector, while the attacker chooses how much data to exfiltrate in each time step. We present novel algorithms for approximating the optimal defense strategies in the form of Stackelberg equilibria. We analyze the scalability of the algorithms and efficiency of the produced strategies in a case study based on real-world uploads of almost six thousand users to Google Drive. 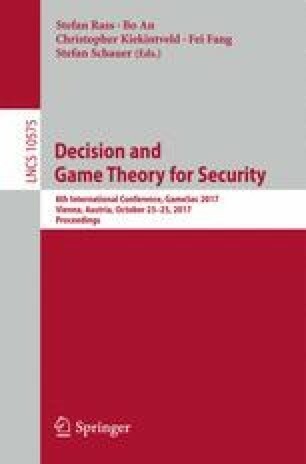 We show that with the computed defense strategies, the attacker exfiltrates 2–3 times less data than with simple heuristics; randomized defense strategies are up to 30% more effective than deterministic ones, and substantially more effective defense strategies are possible if the defense is customized for groups of hosts with similar behavior. This research was supported by the Czech Science Foundation (grant no. 15-23235S).